At first glance, Hall’s steel, glass, silk, and wooden objects might refer to constellations, while his graphite works-on-paper appear to be dense, abstract fields of marks. But his work, which is on view in the current exhibition “Andy Hall: Shapes of Time” at Jack Geary Contemporary, subtly represents time and its relationship to material. Whether creating durational drawings at two-, four-, six-, and eight-hour intervals, capturing a week’s worth of sunlight to power a sign, or translating metered rhythms into patterned shapes, such as his perforated and marked “Folded Square” series, Hall establishes a concrete, visual relationship between time and space through self-imposed parameters and systems. A longtime drummer, he draws influence from music, a discipline that relies on rhythm and timekeeping; his serialized works could be conceived of as various musical movements. The peculiar-looking works in Hall’s “Expanded Shape” series evade easy categorization, but probe the story behind these elusive objects and the artist’s concern with the passage of time emerges once more. Set into the middle of foam-filled, wax-coated canvas pillows are fragments of colored glass given to Hall by his father, the waste items accumulated in his engineering workshop. The artist approaches his father’s heirlooms with reverence, as time capsules that require careful preservation. Hence the protective frames that Hall embeds each glass piece into. Meditative and deeply personal, Hall’s works speak to both the universality of time and the unique resonances and experiences it evokes for each of us. 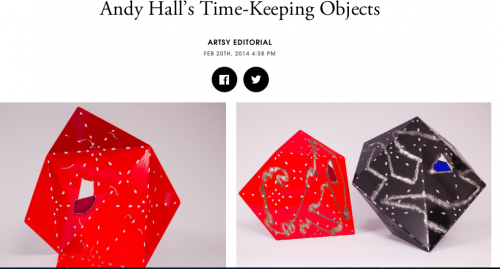 “Andy Hall: Shapes of Time” is on view at Jack Geary Contemporary Feb. 19th to Mar. 21st, 2014.